The 2010 Everett Shootout was a huge success and once again I’d like to thank everyone who came out and participated! We had 27 players, 5 of whom picked the Everett Shootout as their first USRA tournament. We drew players from all skill divisions starting with the 6 who registered in the D division all the way up the 45+ Open draw that had 5 participants. We even had five women and one junior player who came out and played! The tournament started off at 10AM with the Men’s 45+ Open, Men’s Elite, and Men’s C divisions. Robert Allen, ranked 20th in the state, won four of his five matches in the Men’s 45+ division, losing a single match to Neal Heggen who won by one point in the tiebreaker. Neal Heggen came in second place, followed by Paul Stredwick who came in third. In the Men’s Elite division, the Ruckman Nilsen defeated Favian Elmore and Neal Heggen to take first place. Neal Heggen came in second after losing to Ruckman Nilsen by a single point in the tiebreaker game of a very close match that drew a lot of spectators! In Men’s C, newcomer Gene O’Neil came in first by defeating all three of his opponents. Danen Barnhart, who was also playing his first tournament, came in second, followed by Allyn Baker in third. At 11AM the Men’s A and Men’s B divisions started. The Men’s A division was the largest division in the tournament with 9 players. The division was split into two pools of 4 and 5 players. In the first pool, Adam Staudinger came in first and Patrick Reichmann came in second while Ty Sauve came in first and Jimmy Staudinger came in second in the second pool. Adam Staudinger defeated Jimmy Staudinger by a score of 8-4, 8-0 to make the finals against Ty Sauve who defeated Patrick Reichmann by a score of 8-4, 8-7. The finals match between Adam and Ty went all the way to a tiebreaker game where Ty defeated Adam by a score of 8-3. The Men’s B division tied with Men’s D as the second largest division in the tournament. Seamus Brugh who was also playing in his first tournament, took first place and defeated all five of his opponents. Ryan Matthews came in second followed by Geoffrey Bedell who came in third. The Mens’ D division started at 1PM. Ashif Nazirudeen, yet another of our new players, took first place, followed by Tricia Web in second and Adrianne Matthews in third. 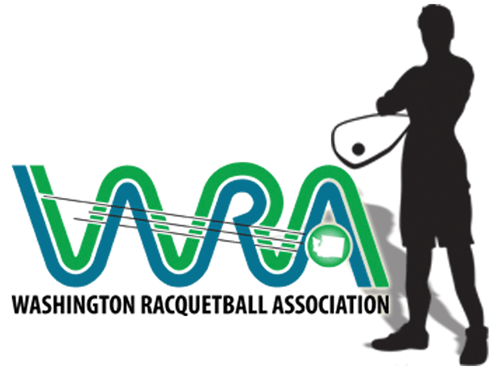 We’d like to say a special thank you to the Everett Family YMCA, who provided a great facility and has been a great supporter of racquetball!